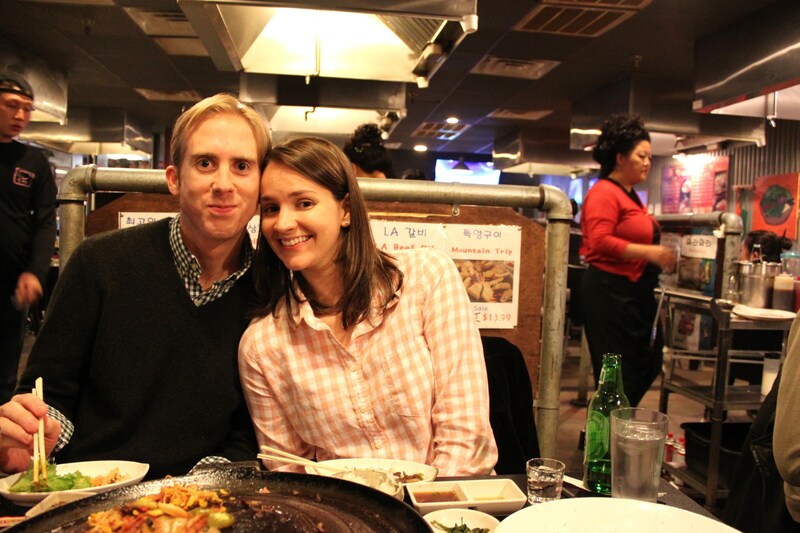 Friday night I was promised a trip to Honey Pig Korean BBQ in Annandale, VA. My friends and hosts, Beth and Travis, gave it high regards after a trip with friends several months ago and promised not only great food but an experience to write home about. The restaurant is one of the more fast paced places I’ve been to – as your sit down small dishes of salad and condiments arrive before they can even take a drink order. Korean pop music plays loudly in the background giving little ability to hear or ask questions. An all female staff of all ages wearing heavy eye make up, childlike hair styles and Honey Pig t-shirts crowd around you like judges to the awaiting show. We ordered the Seafood Pancake which seems to be an egg based thin pancake filled with green scallions and a variety of seafood – I especially like the small purple squid that poke out of the edges of the slices. For the BBQ, we ordered marinated short ribs, marinated bulgogi and sliced pork belly. These were served with traditional Koreon condiments like kimchi and various cold gelatinise substances, soy, chili, garlic, lettuce and rice. The most intimidating part of this experience is the teacher-like judgement that the waitresses make while walking around. They seem to peer over you like you are taking a test and they are monitoring your progress. I was actually corrected several times for the dipping my beef in the incorrect sauce. At Honey Pig, everything seems to be on sale which makes for a reasonably inexpensive dining experience. The atmosphere is of course, free! And the blaring Korean pop music only prepares you for the anticipation of karaoke next door. Travis was nothing but reluctant about stopping next door for karaoke but with a bit of peer pressure he may now be karaoke obsessed. Already karaoke obsessed, I have been searching for a place like Dain Cafe & Karaoke for several years. Instead of the traditional embarrassing singing in front of numerous strangers and crossing your fingers in hopes to sing your favorite guilty pleasure ballad – these places provide a private room for karaoke! Complete with two flat screen televisions (playing Korean music videos), disco lights, two voice enhancing microphones with echo, a four-inch book of songs and a red button on the booth table for bar service. Several hours of karaoke later we had worked off a bit of the pork belly BBQ and lost most of our voices. 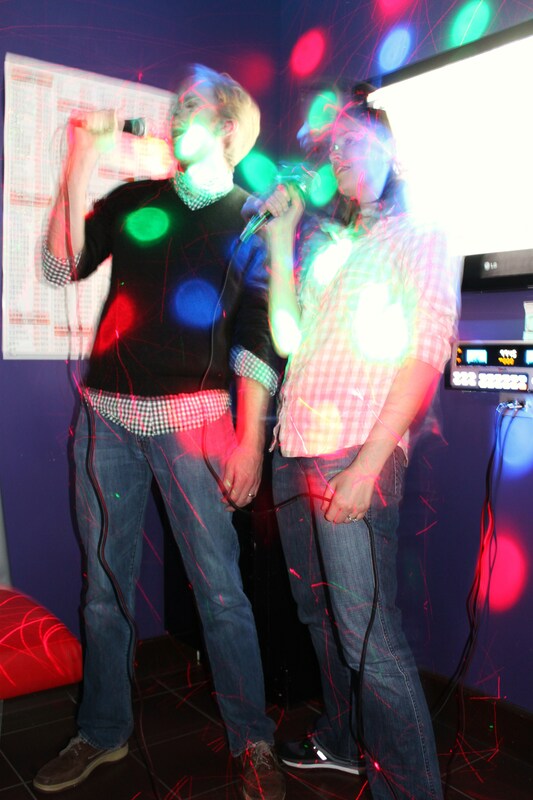 There is no doubt that we won’t return to the Honey Pig and Karaoke experience. I have a feeling Travis will be back sooner than later – he wants to have a Korean karaoke birthday. Hello! We just saw your post and wanted to thank you on the post! We also have a karaoke bar across the street called Wara Wara. Karaoke’s on us this time! We hope that you can stop by again. Email us at gracelee@mabusinessgroup.com on the date and time that you can visit us again. Thank you!